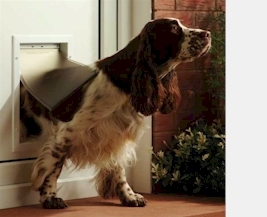 Available in four different sizes, the Aluminium pet doors are constructed of a sturdy aluminium frame and hard-wearing flexible flap to cater for the most boisterous pets! Easy to maintain, clean and operate, the pet door also includes a closing panel for when it is not in use or you want to keep your pet in. Description This door gives your pet all the freedom he needs. Easy to install, the solid aluminum frame has reinforced corners for heavy use or for multiple pet homes. The flexible, soft flap is tinted and adjustable. A magnetic flap closure and pile weather stripping along the sides of the flap.. Description Replacement Flexible Flap for Staywell 600 Pet Doors - Small - Including flap magnet Part Number: PAC11-11037 size = 5 1/8" x 7 5/8" .. Description Replacement Flexible Flap for Staywell 620 Pet Doors - Medium - Including Magnet Part Number: Part Number: PAC11-11038 size = 8 1/8" x 11 3/4" .. Description Replacement Flexible Flap for Staywell 640 Pet Doors - Large - Including Magnet Part Number: Part Number: PAC11-11039 size = 10 1/8" x 15 3/4" .. Description Replacement Flexible Flap for Staywell 660 Pet Doors - Extra Large With Magnet Part Number: Part Number: PAC11-11040 size = 13 5/8" x 23" .. This item is 20mm No Ply Replacement uPVC Door Panel - 750mm x 750mm If your door is double glazed, and you need a uPVC panel to replace the glass to fit your cat flap, If you have a cat flap you no longer require, this uPVE replacement panel is your answer. Also vailable in thr.. This item is 20mm With Ply Replacement uPVC Door Panel - 750mm x 750mm If your door is double glazed, and you need a uPVC panel to replace the glass to fit your cat flap, If you have a cat flap you no longer require, this uPVE replacement panel is your answer. Also vailable.. This item is 24mm No Ply Replacement uPVC Door Panel - 750mm x 750mm If your door is double glazed, and you need a uPVC panel to replace the glass to fit your cat flap, If you have a cat flap you no longer require, this uPVE replacement panel is your answer. Also vailable in thi.. This item is 24mm With Ply Replacement uPVC Door Panel - 750mm x 750mm If your door is double glazed, and you need a uPVC panel to replace the glass to fit your cat flap, If you have a cat flap you no longer require, this uPVE replacement panel is your answer. Also vailable.. This item is 28mm No Ply Replacement uPVC Door Panel - 750mm x 750mm If your door is double glazed, and you need a uPVC panel to replace the glass to fit your cat flap, If you have a cat flap you no longer require, this uPVE replacement panel is your answer. Also vailable in&nbs.. This item is 28mm With Ply Replacement uPVC Door Panel - 750mm x 750mm If your door is double glazed, and you need a uPVC panel to replace the glass to fit your cat flap, If you have a cat flap you no longer require, this uPVE replacement panel is your answer. Also vailable..